I had see that many times with different customers and on forums. When you have Windows 2008 R2 managed by VMM 2012 and after upgrade the Hyper-v host to Windows 2012 and try to install the VMM agent you get error. unpack like "msiexec /a vmmAgent.msi TARGETDIR=C:\1"
2 cd /D "C:\1\PFiles\Microsoft System Center 2012\Virtual Machine Manager\bin\"
4. test to register counters. VMM cannot find a required object. Ensure the object is valid, and then try the operation again. 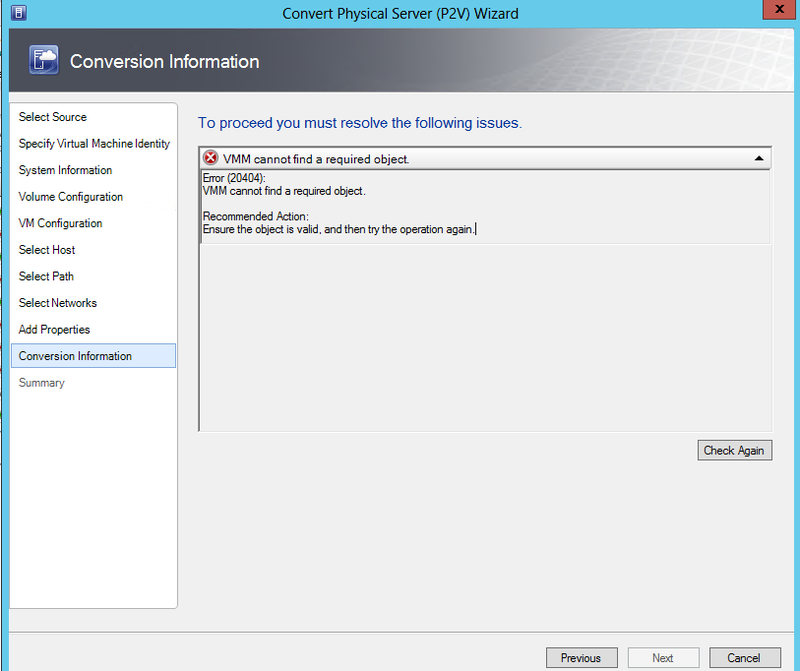 Description: The Physical-to-Virtual (P2V) feature will be removed from the System Center 2012 R2 release. There are other 3rd party options for P2V migration include Novell’s Platespin, DoubleTake Move, Acronis, or Microsoft Disk2VHD. These guides contain instructions for setting up a test lab that uses System Center 2012 Service Pack 1 (SP1) – Virtual Machine Manager (VMM). The guides describe how to deploy a VMM management server and a host in the test lab, and then tell how to use those servers to deploy multiple virtual machines that can work together to provide services. The virtual machines that you can deploy include web servers and servers running SQL Server 2012. After you create VMM profiles and templates, such as the ones described in these guides, it is a straightforward process to deploy as many sets of virtual machines as needed. This guide contains procedures for setting up a test lab that is based on the foundation provided by the Test Lab Guide: Deploy Virtual Machine Manager. The procedures show how to deploy virtual machines by using profiles (such as application profiles) and templates (such as virtual machine templates and service templates). The guide represent the templates and profiles that you can create when you perform the steps in this guide. With these templates and profiles, you can first deploy a web server, and then a pair of virtual machines—a web server and an instance of SQL Server—to represent virtual machines that could work together as a service that you provide to users.